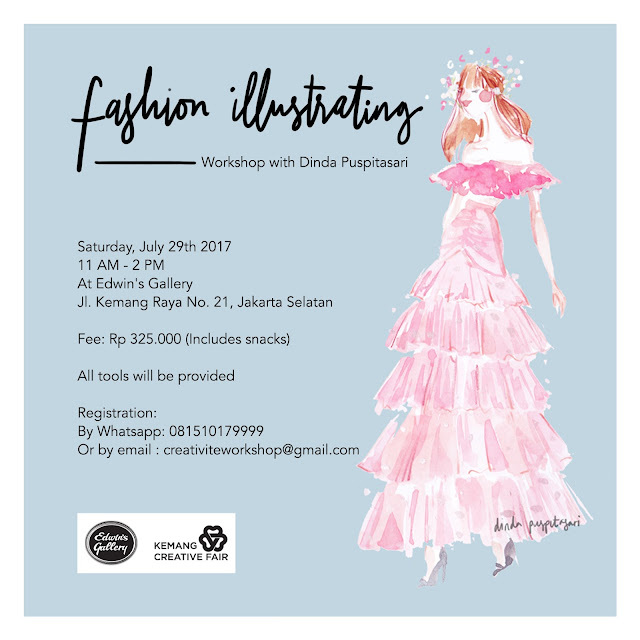 My upcoming fashion illustration workshop, on July 29th 2017. This time I'm partnering again with Edwin's Gallery to hold the workshop, as a part of Kemang Creative Fair. 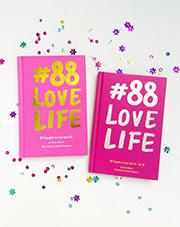 This class starts from the very beginning, so don't worry if you're a beginner. You will be provided the complete set of watercolor paper, brush, paint, and a template book. We will start with the basic figure drawing and create the dress silhouette. I will do a demo of how I do my illustration. Feel free to record the process as you need for practicing. I woke up feeling terribly sick this morning but I had a deadline to submit by noon. So I forced myself to work and submitted the design. I was planning to go work out before catching the movie with hubby but I just had no energy left to do anything but snuggled up in bed the whole evening. I couldn't sleep any second so I just covered myself with the blanket and tried to get some peace. As I felt better after a few hours, I then left home a little bit too late (thank God I arrived in Pacific Place just in time) to watch Spider-Man Homecoming. I didn't see the trailer so I watched with no expectation. I really like the movie, in fact the movie left a few butterflies in my stomach thanks to my fictional love, Tony Stark. The movie itself is an 8.5, but with Tony Stark in it, it reached 9.5 to me heheh. Also.. I've been trying to catch up with the couture week happening in Paris right now and posted a few of my favorites on Instagram. If you guys are familiar with my Instagram Story, you must be aware that I really love TUKU coffee. It's their simple iced coffee called Es Kopi Susu Tetangga that keeps me coming back. Very affordable and comes in a very pleasant taste, I like mine to have less ice, so the coffee is stronger. Here's one post from my Instagram if you're not familiar with this iced coffee that I'm talking about. Tidak terasa lebih dari 2 tahun kami telah hadir di Cipete. Dengan hadirnya Bapak Jokowi beserta keluarga ke #tokokopituku sebagai seorang Pemimpin Negara Republik Indonesia, telah menciptakan nuansa baru di tengah lingkungan TUKU. . . Kami sangat senang atas kunjungan singkat Bapak kemarin, kehadiran Bapak telah membuat kami serasa memiliki tetangga yang lebih luas lagi. Semoga segala kehangatan yang Bapak Jokowi dan Keluarga berikan kepada kami, dapat terasa oleh #tetanggatuku yang hadir di Toko ataupun yang menonton vlog milik Pak Jokowi. . . Terima kasih Bapak Jokowi untuk semua motivasi yang diberikan, semoga semua pesan dan harapan Bapak untuk kami, dapat kami segera realisasikan. Sehingga usaha lokal seperti kami ini dapat ikut berkontribusi terhadap kemajuan bangsa & negara. My favorite president is having Tuku!! OMGGG how can things be even happier?? I don't know why but I feel soooo happy seeing this and reading the news all over the national media. Maybe it's because I really love their coffee, that's why I'm soooooo happy that Tuku's hard work is being paid off really well. See?? Do you get my point? Work so hard and always do your best, the universe will eventually work for you if you're doing great and aim for the highest. Even a coffee joint in the side street of busy Cipete being visited by the president. This wouldn't happen if Tuku didn't make the best coffee in a small cup on the first place. If the coffee isn't that good, they wouldn't be so viral until the news reached the president's son and have his dad visited the small joint in Cipete. This is a note for you, Dinda. Always do your best, exceed the expectations, and Allah will help you find the way, InsyaAllah. Hello! 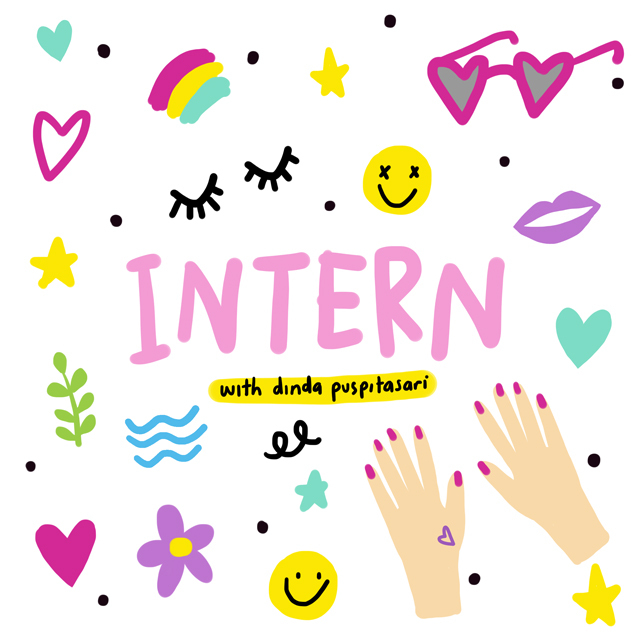 Do you know anyone who would like to join me as an intern? My former intern has found her true DNA as a geographer, so I need a replacement! I'll be waiting for your email!